Though Bbuddah Hoga Tera Baap's opening was not good but the film has been generally liked by the audience. The film being a tribute to Amitabh Bachchan's persona of the past has specially appealed to his fans. Overall the feedback is that its a good time pass entertainer worth spending money on. The film's Box Office performance has been affected quite a bit by Delhi Belly but Bbuddah Hoga Tera Baap has an advantage that its a family film unlike Delhi Belly which is meant only for adults. The trends indicate that the film should be able to sustain because despite not having a huge audience, it is being accepted by most people who have seen it. It’s an inoffensive but lazy film that barely scratches the surface of this big, bright shining star.... If you’re an unconditional fan though, you’ll make your peace with this one. 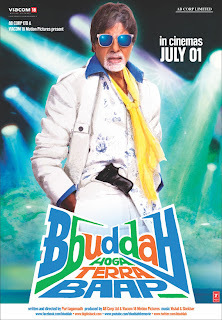 Bbuddah... is a high dose entertainer when the veteran actor never stops amazing you with the range of his histrionics. On the whole, BBUDDAH HOGA TERRA BAAP is a must-watch for Bachchan fans. ..it’s certainly one of the better Bachchan films of the past half decade, a period that has done little justice to the man’s track record. And did I have fun watching it? I sure did! BBUDDAH is purely for Amitabh Bachchan fans.